What We Wanted To Tell You About Mumps But Couldn't : Shots - Health News A web of embargoes meant the full story on a 2009 mumps outbreak couldn't be revealed until now. Now we can tell you about the effect of an extra dose of vaccine worked and whether doctors recommend that others get a third mumps shot. 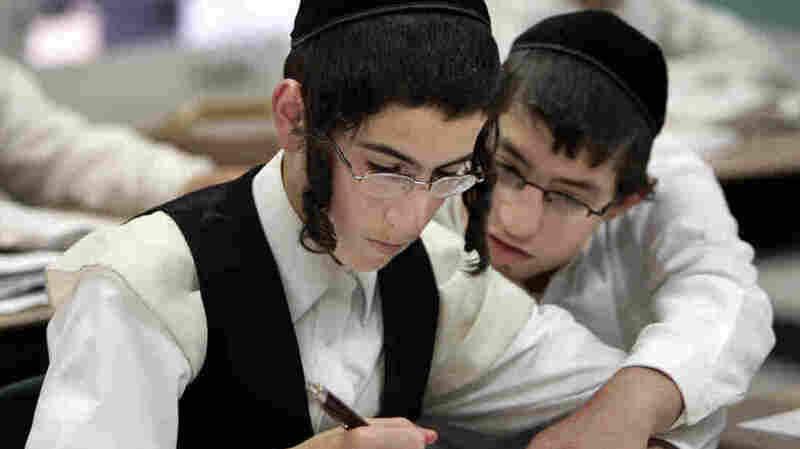 Two boys study together at a Chicago yeshiva in 2009. Public health officials say this type of close physical contact helped fuel a mumps outbreak throughout several orthodox Jewish communities in and around New York City. Each dot represents one case of mumps between late June 2009 and late June 2010. 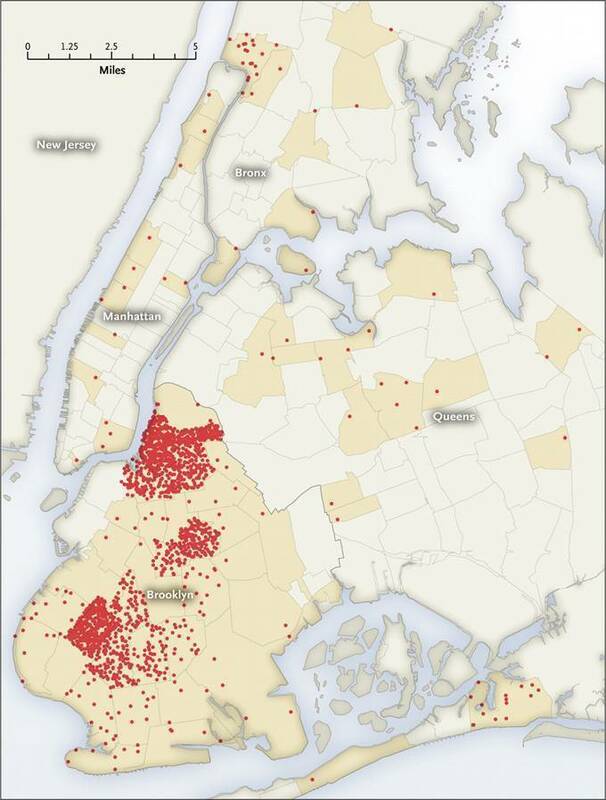 During a 2009 outbreak, the mumps virus spread widely throughout several Orthodox Jewish communities in and around New York City, even among those who had been vaccinated. Public health officials determined a quarantine wouldn't help. "We noticed that, no matter what measures we instituted, the mumps outbreak wasn't stopping," says Dr. Preeta Kutty, an epidemiologist with the Centers for Disease Control and Prevention. So, after consulting with local religious leaders and the New York State Department of Health, the CDC decided to try something new. It administered a third dose of the measles-mumps-rubella, or MMR, vaccine to children in the exposed Jewish communities who hadn't yet come down with the disease and who had already received the standard two doses. The CDC's experiment appeared to be successful. The percentage of children in these communities who had mumps went from nearly 5 percent to less than half a percent after an extra shot. For the entire community, the percentage of people — adults and children — who had mumps was reduced to a quarter of what it was before the third-dose intervention. Kutty says it's premature to say whether everyone should get a third dose of the MMR vaccine. First of all, she says, it's likely that the outbreak was already on the decline by the time the CDC tried its intervention. Also, the fact that the outbreak was largely contained to just a few neighborhoods, and that 97 percent of the people infected in this outbreak were Orthodox Jews, indicates that the standard two doses of MMR work just fine for most people. "What this outbreak shows is that the two-dose schedule is sufficient to control outbreaks," says Albert Barskey, another CDC epidemiologist who worked with Kutty. "This didn't spread to the broader community." However, Kutty says administering a third dose of MMR might offer a powerful protection for people living within a community undergoing a mumps outbreak. "We'll have to try that in another outbreak and see what happens," she says. Kutty's findings are published in the current issue of the journal Pediatrics. Last week, we wrote about an outbreak of mumps within several Orthodox Jewish communities in and around New York City. We told you how the outbreak spread so rapidly in 2009 that public health officials tried something that hadn't been done before. Doctors gave uninfected children who'd already been immunized a third booster shot of the measles-mumps-rubella, or MMR, vaccine. Two doses is the usual regimen. After reading our post about the outbreak, you might have wondered if it worked. And maybe you even asked if you or your kids should get the extra shot. We would have loved to answer those questions for you when we wrote our first story. (See the sidebar for the answers now.) But we couldn't tell you what we knew because the information was under wraps. Officials from the Centers for Disease Control and Prevention who fought the outbreak in New York wrote about it in three different papers published at different times in three different journals. Two of the papers came out last week. The third one — the one that included information on whether the broader public should get an extra booster dose of MMR — wasn't published until this morning. Until now, every detail in that paper — even its existence — was under an embargo. What's an embargo? Well, at the risk of getting a little too inside baseball, here's how it works. When a scientist perform experiments, they write up the important results and submit them to journals: Science, Nature, JAMA, there are hundreds. If the journal editors accept a paper, they'll typically send out an email to selected journalists with a brief summary a few days before the paper is published. But, there's a catch: only journalists who agree not to write anything about it until publication can get the preview. That's the embargo. After we found out there were three papers about the mumps outbreak, rather than one, we contacted Pediatrics, the journal that was preparing to publish the third paper, to see if the editors would lift the embargo early so we could give you a fuller picture of the outbreak. They declined. Dr. Lewis First, the editor of Pediatrics, said our request was the first time he became aware that CDC officials had published two additional papers on the mumps outbreak in other journals. "If the [CDC] had informed us, we would've done what we could to coordinate our efforts," he said. But First says dropping the embargo under the circumstances would have been impossible because the journal's staff didn't have enough time to prepare the paper for early publication online. Apparently, the authors of the three papers decided independently to submit their research to different journals, CDC spokeswoman Jeanette St. Pierre told us. Embargoes are pervasive in science and medicine. They're meant to give journalists more time to report on complex, difficult to understand issues. But they can also cause headaches. If reporters so much as whisper detail about embargoed papers — in some cases, even detail that have been independently verified — the journals can punish the journalists and the outlets they work for by cutting off access to embargoed material. To be sure, most journals do have a policy of lifting embargoes if the information bears on an imminent public health threat. Ivan Oransky, the executive editor of Reuters Health who also is co-founder of the blog Embargo Watch, said embargoes should be about improving the quality of scientific communication. But, he said, they are often more about preserving journals' status as gatekeepers. "If the point of a journal is to get vetted scientific information out there, they should be able to put it out as broadly and as quickly as possible." This episode, he said, is "another example of a journal putting its own publicity over the public health." Not so, said Pediatrics' First. He wishes this all had happened differently and that all the information could have been released at the same time. "I'm not trying to block the exits," he said. "I'm trying to get everything to publication as quickly as I can," he said. "We don't talk about [our papers] saying 'Ooh, let's hold onto this one so the spotlight can shine on our journal.' It's not like that at all." As for the CDC, St. Pierre said that after talking with us, her team sat down and discussed how this all played out. "It was unfortunate," she said.